Can definitely confirm 30BFRIDAY for multiple uses. Got the Apu trilogy for $34.99 (so I'm guessing members will be able to get it even cheaper as mentioned a few posts above, but either way the price is great). Two regular Criterions -- with the discount applied to one -- work out to about $34.00 + whatever tax, which is a decent price for non-members, and again I'm sure members will fare even better. Excellent!!! I ordered America Lost And Found for $46.19 shipped. I had been ignoring this year's sale, but with the 30% off, I couldn't pass up The Apu Trilogy for $38.10 (after taxes). My first and only order. Jesus. Goddamn lurker speaks up. 7th post in 11 years. + The Brood and Mulholland Drive purchased a couple weeks ago. Picked up Ikiru and Apu Trilogy with 30% off today. Dunno if its been mentioned before but they are running a one day promotion today that gets you a $10 GC for $50 purchase of Gift cards. The bonus GC is to be used b/w late Dec and Mar 31st. Looks like Ikiru is sold out online except for some 3rd market sellers. It is available in store. I actually bought a 50 dollar gift card and then turned around right there and used it to pay for Ikiru and Apu Trilogy along with the coupons and membership discount. Still had a few bucks left on my card. The clerks were surprised that none of the customers they have had today were smart enough to do this with all of the stuff people were buying today and the store was more crowded than it is on most other days. The promotion is on their website, and says it's running through the weekend. Used by Mar 31st is crap, it used to be longer. Is there even any decent sale from them til then.. Thanks for mentioning this, though I definitely had some hassle with it. I stopped by the supermarket and bought a B&N gc there (for the gas points), which combined with leftover funds from the last $75 gc deal would equal $50, which would pay for this. I got up to the register and the employee seemed friendly enough, even suggesting I buy $100 or $150 in gc's if I could afford it, for more $10 ones. But as soon as I put forward my gc's to pay then he seemed confused, and then asked for help. There was a woman behind all the cashiers, going between them like a coach or something, and she was angry and indignant at the idea, saying that I was entirely in the wrong and trying to cheat them. She then pulled out an internal memo from someone (maybe in-store, maybe for the region/area?) saying that gc's would not be accepted for this. I didn't want to deal with such a "righteous" person, especially as I didn't have the terms handy, so just asked to buy my one book and checkout. Of course the employee couldn't understand why I didn't still want the $50 promo, even though I'd explained that I just spent $38 buying a B&N gc at the grocery store. Meanwhile I drove to the next store, where the very nice cashier had no trouble doing the deal. Then took 2x 30% coupons in a row, and a 3rd one 10 minutes later when I decided to buy yet another book. So: lovely experience at 1 store, and seriously power tripping employees at the other. Meanwhile, I logged into my B&N wish list for the 1st time since they "upgraded" the site. 2 of my approx. 180 wish list items remain, with the rest gone. Is this normal? Does anyone know if contacting them would accomplish anything? Any chance the Blu-ray versions of Ikiru and In The Mood For Love will be back in stock online before the Black Friday coupon ends? I don't want to spend more money traveling to Barnes and Noble. There will likely be some good deals scattered around from 12/26- 1/1. They have also had a B2G1 free sale in January. Combined with the use of the 30% off coupon this weekend, the gift card promo seems like a no-brainer to me. I'm not buying a lot of DVDs/Bds anyway. For me, it's working out great for books. Killer bargains on things I've had my eye on for a while. true but you'd gladly take a later expiration date if given the choice, right? But In the past there has always been a release or two (or three) that streets just outside the holiday promotions. Any December or January Criterion releases for example. Sometimes it's great not to have to wait for July to pick those up. Maybe it's a couple Shout/Scream Factory titles...who knows. But really the thing is, if you are going to buy any stuff with the 30% off coupon now, you may as well pick up a GC first and pay for it that way. I just found some expensive art books I didn't realize they carried so I'm going to be grabbing at least a couple more GCs tonight. Unless B&N goes under, they will certainly get used up sooner or later. It should still be cheaper elsewhere. 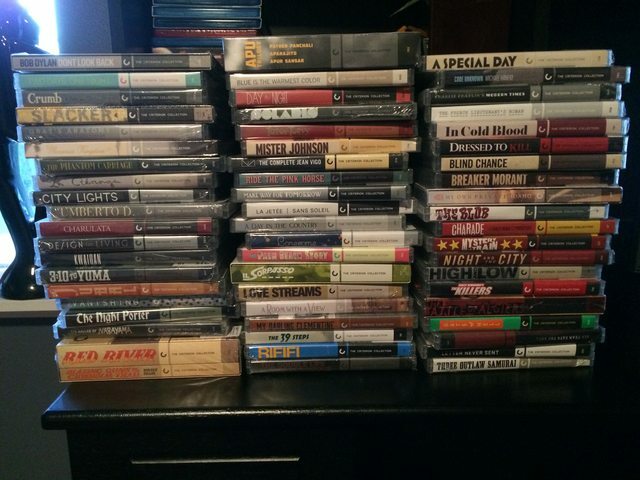 $40 Criterion minus $10 GC = $30. C'mon, you can do a lot better at other etailers usually hovering around the $22-$25 price point range. But you can call me a nitpicker all you want. Yes, if you use the GC for something full price, you aren't realizing any value from the deal. But let's say they have a B2G1 sale in January and there are three $40 titles you want. In store, with a membership + the gift card those 3 will cost you $62 + tax- or in other words pretty close to 50% off each one. For well post holidays sale prices, that's a solid deal to me. YMMV of course. the BF coupon can be used repeatedly for online too, yes?